At Southcoast Centers for Cancer Care, we specialize in offering patients specialized cancer treatment options that are proven to work, whether that’s through hormone therapy, chemotherapy or radiation at our centers in Fall River or Fairhaven, MA. Radiation therapy is a common treatment option for cancer that uses ionizing radiation to kill cancer cells and shrink tumors. At the Southcoast Centers for Cancer Care, your care will be managed by an experienced team of board-certified oncology physicians, nurses with specialized knowledge of radiation therapy, and support staff to make your journey as smooth as possible. In addition to the direct care givers you will also have access to our social workers, finance counselor and navigators to help you every step of the way. External beam radiation therapy delivers radiation from a machine outside your body as you lie on a table. A radiation oncologist or technician directs the radiation beam precisely at the tumor or cancer. Stereotactic radiosurgery and stereotactic body radiation therapy are specialized types of external beam radiation therapy that utilize high doses of radiation in one or few fractions. Internal radiation therapy or brachytherapy involves placing radioactive material inside a tumor or right next to the tumor or cancer to provide a precisely targeted, high intensity radiation dosage right where it’s needed. For example, certain breast cancer patients can receive their course of radiation therapy with one week of brachytherapy. Radiopharmaceuticals are radioactive medications. They are given through an IV (intravenous), in pill form, or are placed in a body cavity. For example, a radiation oncologist uses radioactive iodine to treat thyroid cancer. 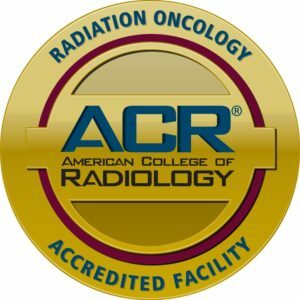 The goal of radiation therapy varies depending on the type of cancer and its stage. It may cure some cancers, especially in early stages. Radiation therapy can also help control symptoms and cancers that can’t be cured. Potential side effects of radiation therapy vary depending on the type and dose of radiation, and the body area needing treatment. Your team at Southcoast Centers for Cancer Care can guide you through managing the side effects of your radiation treatments. It is important that instructions be followed carefully during the treatment period. Your doctors and nurses are always available to answer any questions or concerns you may have. People often feel fine right after a radiation therapy treatment. Side effects may develop after a couple of treatments. Fatigue is common, so take care to get adequate rest. Ask your doctor and nurses about precautions with your radiation therapy. With internal therapy and radiopharmaceuticals, you will need to take steps to protect other people around you. External therapy does not make you radioactive. Find an oncologist nearby at the Southcoast Centers for Cancer Care to schedule a consultation and discuss your cancer treatment options. Southcoast Health provides a specialty in cancer care and treatments, including radiation therapy, for patients in Fall River and Fairhaven, MA.